Beets are great. Try them baked, with a bit of oil, S&P. My grandmother (C's great-grand) would make a sandwich of fresh rye bread, butter & sliced radish. The spicy radish & creamy cool butter made a simple yet tasty combo. Thanks for your comment. I've heard several places about radish and butter sandwiches-- I'm intrigued. Beets are one of my favorite vegetables, hands-down. So many people hate them. What's not to love? ooh, that sounds good/wierd, im deffinately going to try one!! Karenjane, you are a courageous soul indeed. This is not one for the faint-hearted. This makes it no less delicious and wonderful. Thanks for reading! I too adore beets but never knew I did until I started growing them myself. I'm going to try your sandwich with the very next jar of pickled beets I open. Thanks for your comment! Beets are truly tasty vegetables, aren't they? All the better pickled. Enjoy! 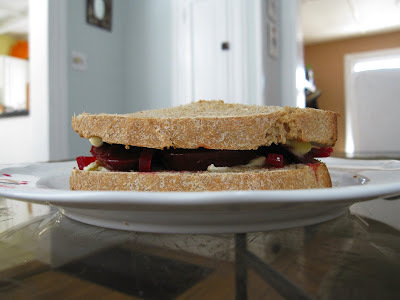 Dude, I discovered (the hard way) that beets are a common hamburger embellishment in Australia. Who woulda thought it! It's definitely an interesting combination, although I really prefer a nice slice of tomato and crispy Kosher dills instead. Beets on hamburgers? Wowza. To be expecting tomato and get beet instead must be an interesting experience. Ahhh, yes. Good old Tom Robbins. That's from Jitterbug Perfume, isn't it?